Kantu browser automation stable version/downloadable plugin? - General Discussion - Forum for Kantu Task and Test Automation and the free OCR API. Kantu browser automation stable version/downloadable plugin? I would like to know if there are any possible ways where I could prevent updating the plugin (kantu browser automation, chrome plugin) to newer versions? As I am testing the plugin for an automation task on a weekly and monthly basis, when a newer version comes up i face some errors in my automation tasks Are there any ways I could download the plugin for customization? or turn off the plugin update ( which I have searched through google already, seems like there are no option). 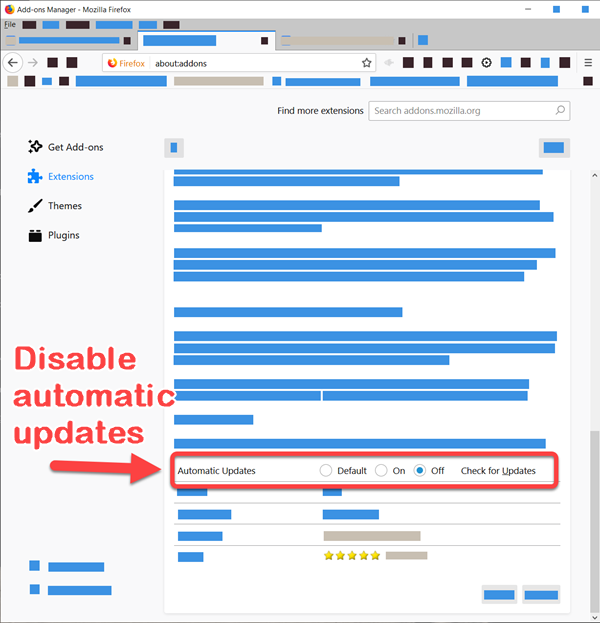 Firefox (easiest option): In Firefox you can disable extension auto-updates in the Firefox addon settings. Go to about:addons, select the Kantu addon and then select the option “Automatic Updates: (x) Off”). See also the screenshot below. Chrome: Google allows external installations from ZIP files only. The drawback is that Chrome will prompt you at every start if you want to keep the externally installed extension. So this method works for short tests, but is not suitable for unattended operation. Chrome, Option 2 (easiest Chrome option): The Kantu Enterprise Edition includes update management support, which makes managing Kantu for Chrome updates as easy as with Firefox. 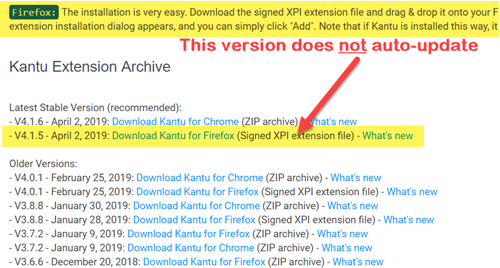 Summary: If you use the free version of Kantu and want to avoid auto-updates, I highly recommend that you use Kantu for Firefox. Macros are 100% compatible with Kantu for Chrome, so switching between both browsers is easy. If you disabled auto-updates, you can still manually click the “Check for Updates” link to trigger an update check and update.